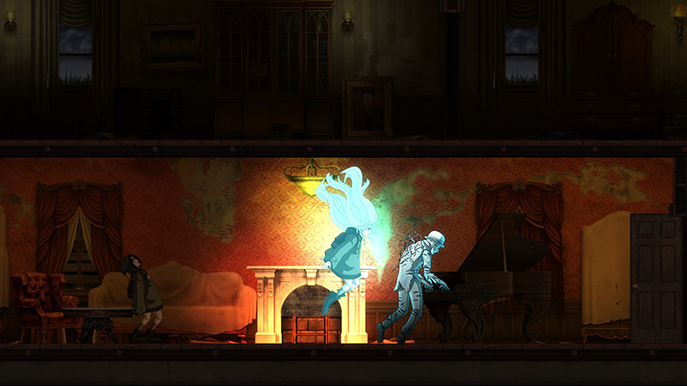 I was immediately drawn to Whispering Willows due to it's beautiful art style. Having watched the trailer and admired some screenshots I bought it. Unfortunately, everything else about Whispering Willows doesn't live up to, or even come close, to the quality of the art. 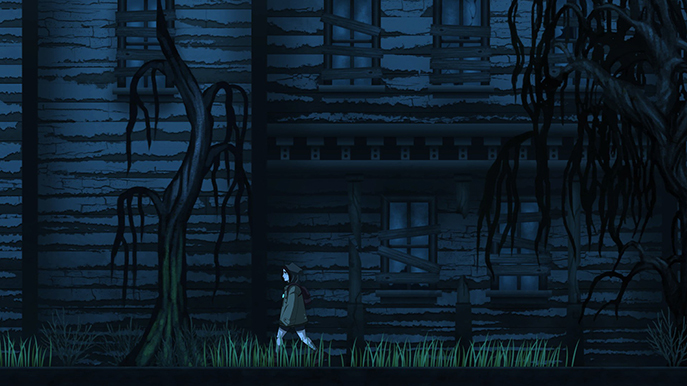 You play as Elena who sets off to an abandoned mansion in the search for her Dad, who has just gone missing. That is where he works and seems like a good place to start. After a short intro sequence – the art in these sequences are quite sub-par compared to the in-game graphics – you find yourself having fallen into the ground's catacombs. Your amulet, which fortunately fell pretty close to you, activates with a green glow and you find you're able to extract your spirit form from your body and can move about freely, as well as talking to other local spirits. The first of these spirits you meet is Flying Hawk, who acts as the tutorial in this first section. The problems in Whispering Willows are immediately apparent. The first area - the catacombs – in which you are tasked with finding Flying Hawk's body and then leaving, took me a frustratingly long time to advance past. 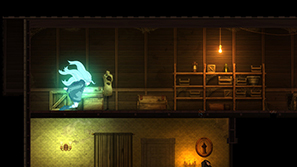 Firstly it teaches you that Elena's spirit can pass through small gaps in the wall and possess things, such as a switch (most of the game's puzzles revolve around this idea). So far so good. However, as you are given the freedom of the area it doesn't take long to get lost. There is no map in the game, areas are often too large and with repeating background art make it very difficult to distinguish one room from another and your location, and no objective re-cap. You can spend so long walking through an area you forget what you're supposed to be doing. It also doesn't help if you have a day or two break between playing. It won't remind you what you're supposed to be doing. Once leaving the catacombs you are free to walk around the entirety of the game's locations (though some interiors are initially locked). Without instruction or guidance when I entered the area and was unsure of where to go. I decide to explore a little and luckily, the first building I went into, the guest house, seemed to be the right choice. 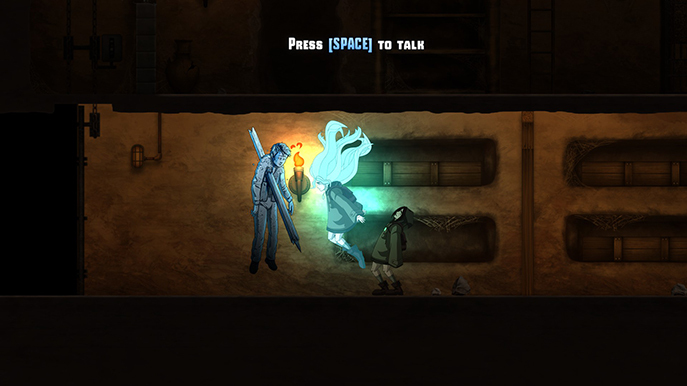 There isn't a lot of challenge in Whispering Willows puzzles. Elena's amulet will glow when you're near a spirit (who you can only see when in spirit form), and right up to the end of the game large button prompts appear over everything. Stop insulting me Whispering Willows! I am more than capable of remembering that to go up or down stairs I need to press W/S. The prompt appears on screen every time you walk near stairs. 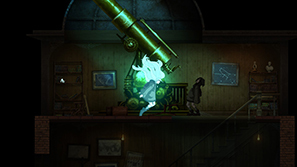 Most of the puzzles are localised in the building you are currently in, with the occasional item bridging the progression between two locales. It is more a case of walk around, explore every room and interact with everything to find the solution rather than know where you should go and what to do. However, later in the game it is easier to know where to go due to the reduced locations (all but the mansion itself are used once). Perhaps my biggest issue with the game is Elena's movement speed. You walk everywhere and you walk slowly. The areas are large and the nature of the game means that you will be exploring and going from one place to another in a trial and error sense to find the correct location to advance the story. You waste so much time slowly moving across these areas and it becomes tedious. You can run, but only in triggered events, and this happens only three or four times throughout the game. The story is certainly interesting and is presented to you at a good pace. You'll meet a number of spirits as you walk around the grounds, all of which seem to have met some grisly end – one character had his right arm and shoulder hanging to the side from a very deep wound and another with a good amount of his head/face missing. They'll tell you about the history of the Willows and community and ask you to help with some things. These are all part of the story. Some spirits just seem to hang about and talk quite nonchalantly. You get deeper context of the narrative through collectables, notes. There are an awful lot of notes scattered across the game and you'll find yourself collecting three in a minute some times. While these were interesting to read they did become a little confusing at times, the sheer number of them and not knowing who wrote them, the game sometimes lit the character's name but when you get a page full it stops. The overall narrative was good; the ending was surprisingly poignant and a good way to end. I just wish it would have been more engaging playing to get to that point. There was little atmosphere throughout the game and at no point did I sense any horror. It appears that was what the game was attempting, but the tedium of the gameplay drained my engagement with it. There are only three (if I recall correctly) 'horror' events in the game, one near the beginning, and that is disappointing. 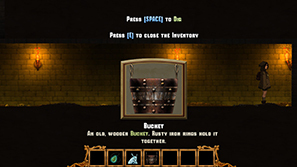 The game suggests something then never really builds up to anything. 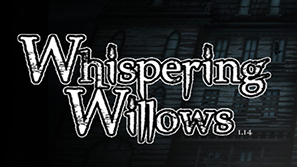 Other than to experience the gorgeous artwork I can't really recommend Whispering Willows. There are too many problems that hamper any type of immersion into the attempted atmosphere and while the narrative concludes in a well written manner, the gameplay doesn't compel you to necessarily persevere.